What do you need to make Slow Good Green Beans? 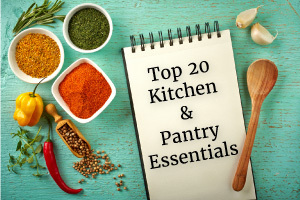 If you have these two things, you can make the best slow cooked green beans you’ve ever had. No crockpot required. They are SO good, I have made them three times in the past week. So good, we ate half a pound of the last batch before I could even photograph them for the recipe. “But they’re just green beans” you say. Big Deal. What makes these green beans SO GOOD? Once you have made them with the magical compliments, fresh tomatoes and roasted garlic (from a jar), you won’t want to make them any other way. Promise. You’ll fall in love too with these tender beans flavored with bits of tomato and roasted garlic jam. Let them cook slowly until they look limp and are about to fall apart. They are not beautiful to LOOK AT, but win first prize in TASTE. Lay out ingredients and then cook s l o w l y. Last month I had a cooking play date with my niece. 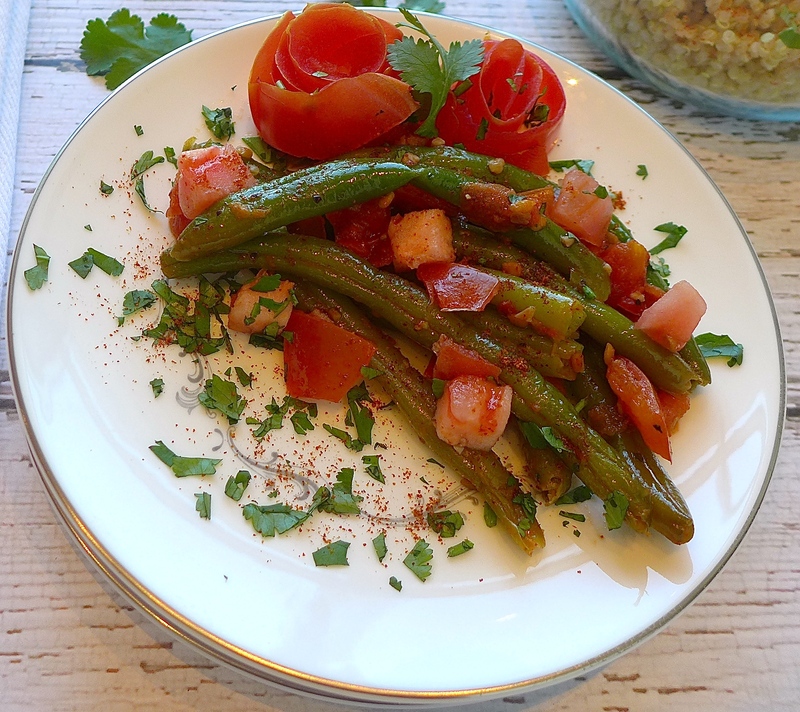 We decided to make some family friendly recipes to expand her dinner rotation, and green beans are one of the few vegetables her husband likes. This easy but intensely flavorful recipe won him over. Blanche the green beans and refresh them in cold water. 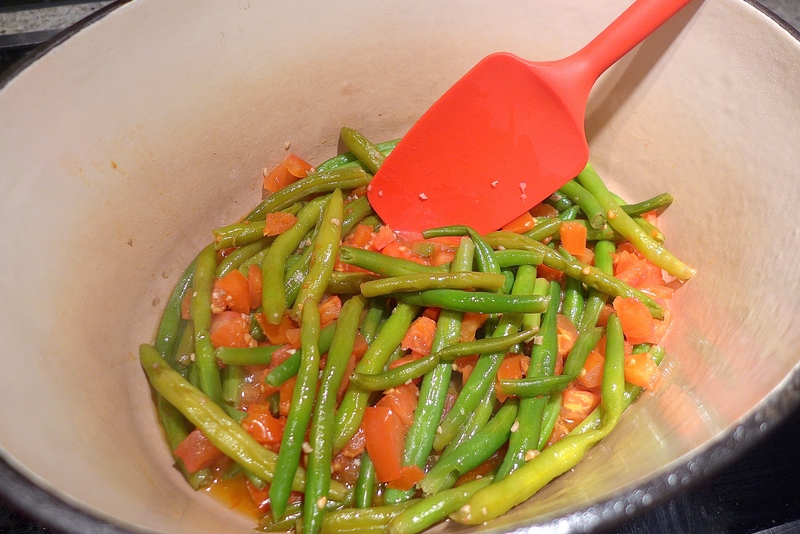 In a cold pot with a lid, place oil, roasted garlic, green beans, then tomatoes. Don’t stir! Let cook on lowest heat, covered, an hour or more until tomatoes begin to melt and beans are very soft. Season to taste at the end with salt, pepper and cayenne. If you are short on time, try making these in the evening after dinner, then reheat them the next day. They are great hot OR cold. 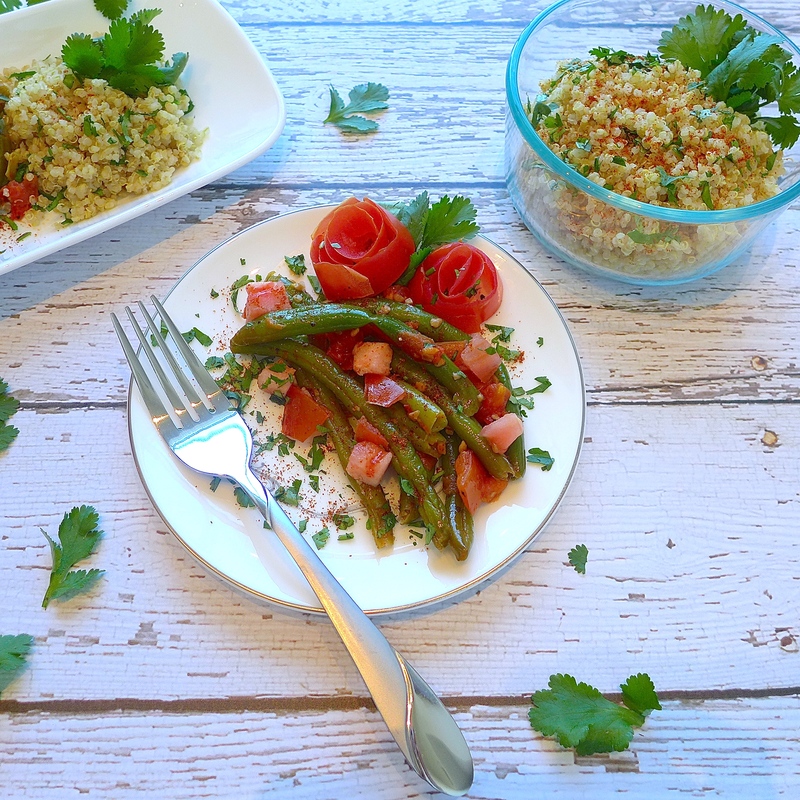 Serve slow good green beans with quinoa or your favorite grain. For extra color and flavor, garnish with fresh chopped herbs like parsley, cilantro or dill. 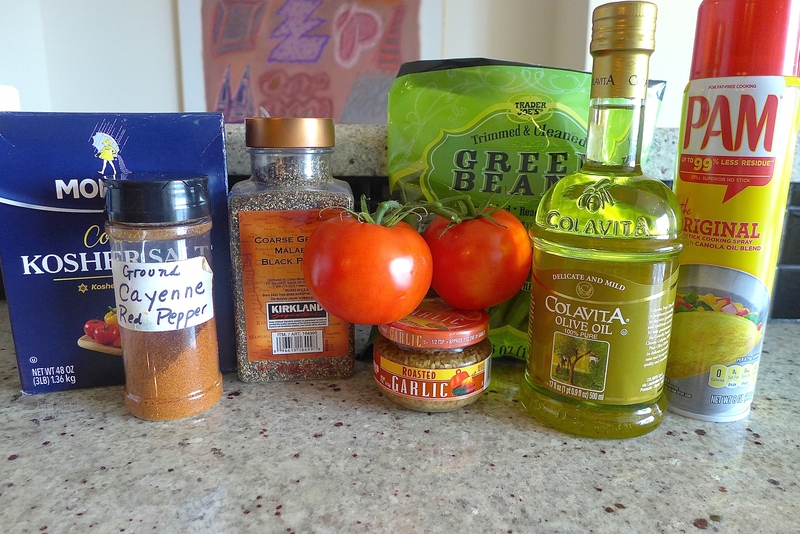 Recipe adapted from Bean by Bean, A Cookbook By Crescent Dragonwagon. 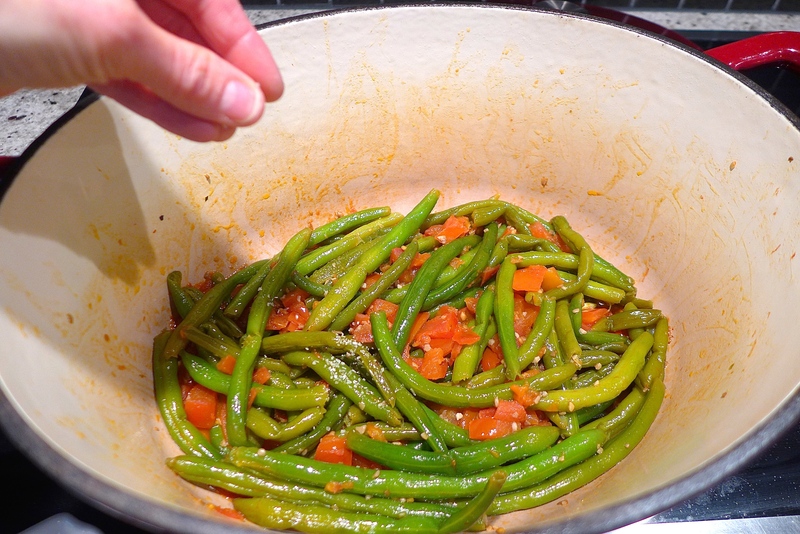 Assemble in minutes and then cook slowly for intensely flavorful green beans speckled with tomato and roasted garlic jam. 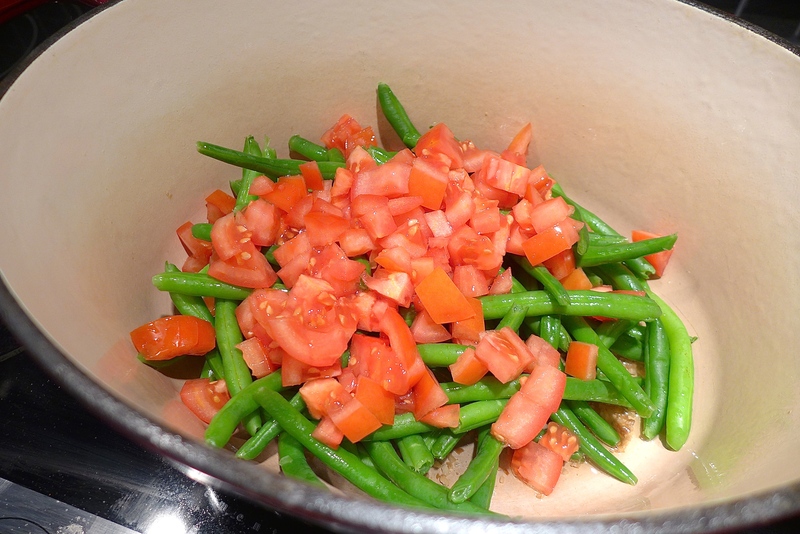 Bring a large pot of water to a boil, add green beans and cook for two minutes. While green beans cook, fill another bowl with ice water. 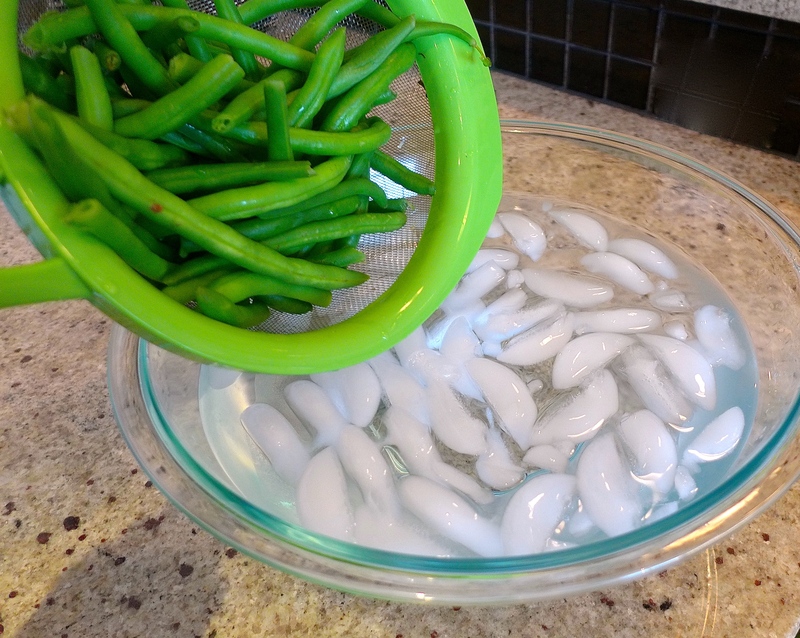 Remove green beans from the heat and drain in a mesh strainer or colander. Plunge beans into the ice bath for a minute to cool them completely, then drain. Set a large pot or heavy-duty skillet with a tight fitting lid on the stove. Spray the inside of the pot with cooking spray. Pour in olive oil and garlic. 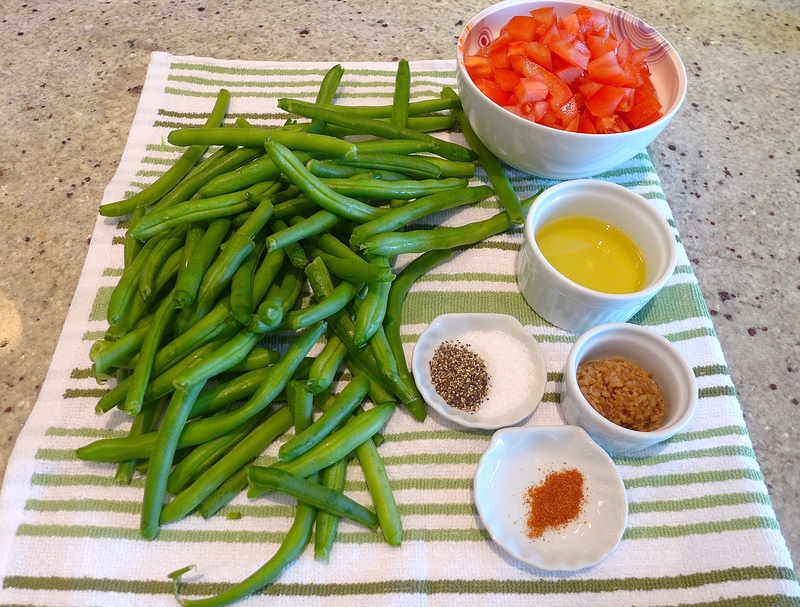 Add green beans and then the tomatoes on top. Don’t stir the mixture. Turn the burner to the lowest heat possible. Cover the beans and let cook without stirring for an hour. It’s going to be difficult not to stir, but don’t stir! Check beans after an hour. If they are not very soft, let them cook another 15- 20 minutes. They should look tender and slightly browned, with sweet bits of tomato garlicky goodness sticking to them. When beans are very soft, remove lid and stir gently. If there’s a lot of liquid at the bottom of the pot, turn up the heat to medium high and stir gently without pausing until most of the excess liquid evaporates. Add salt and pepper to taste and a pinch or two of cayenne. Stir, taste again and serve. Dana keep up the good work. Wonderful ideas. 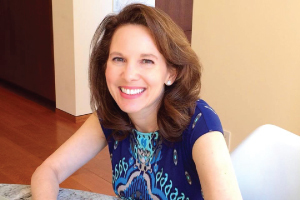 I made these this week–so delicious!